Rum Run Is Done! Like Really Done! Like Seriously, For At Least A Long While! Kangaroo Jumping Game! I’d like to start doing more of these! After all, my main driver for creating games is feeling inspired after playing someone else’s well-designed game, so yes, let’s talk about Uwe Rosenburg’s Glass Road. 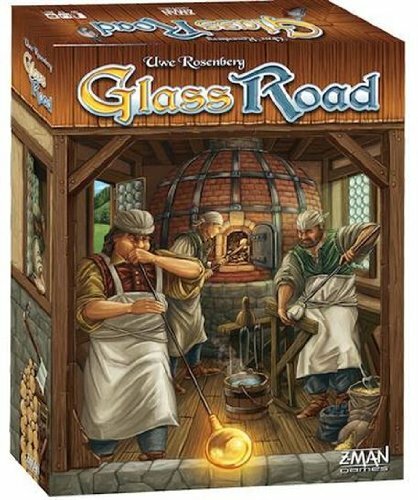 It came out a couple of months ago in November 2013, the same month as his behemoth sequel to Agricola, Caverna: The Cave Farmers. I think it’s wonderful that these two games were released so close together. 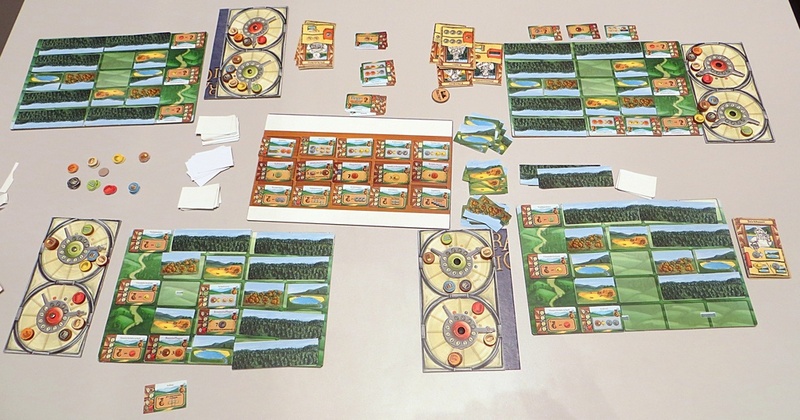 I’m a huge fan of Agricola, but I have not played Caverna. 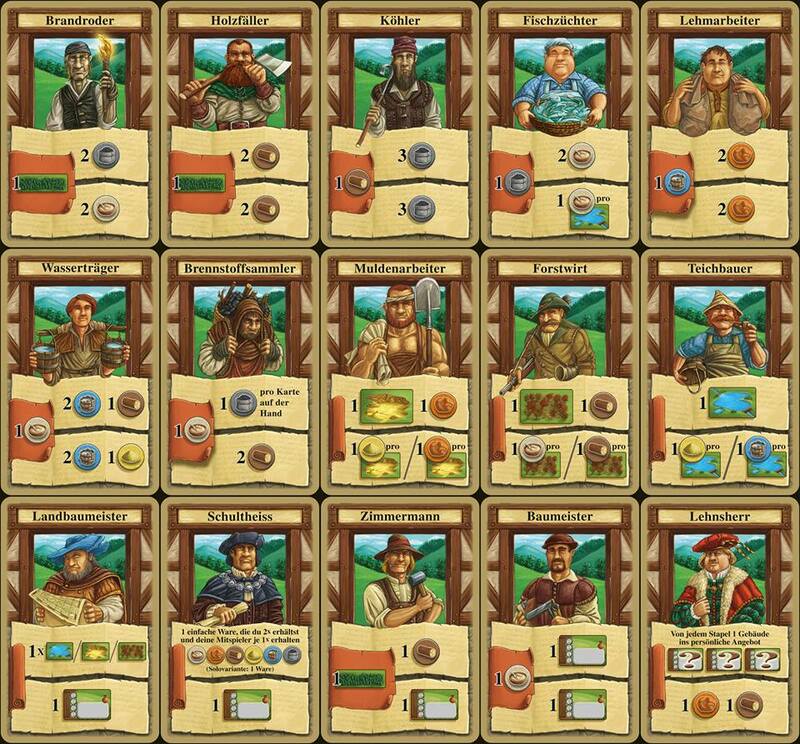 However, my understanding of the game is that it’s like if everything you did in Agricola was your day job, and then there’s other stuff your family members get to do that’s like going on weekend adventures. 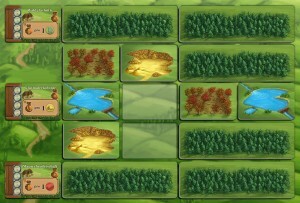 That all sounds dandy, but my initial reaction to that was oh-my-god-Agricola-has-enough-going-on-why-would-you-add-more? But hey, I haven’t played it, so who am I to judge? 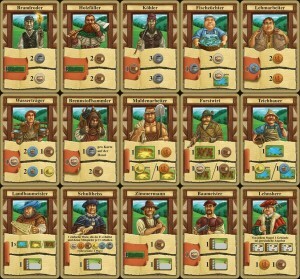 To start, each player has an identical deck of 15 ‘specialist’ cards at their disposal that do things like give you goods or build buildings. 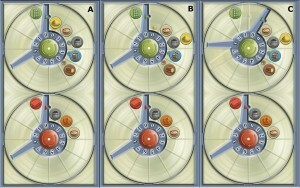 The game is played over 4 building rounds, and at the beginning of each round, each player picks 5 specialist cards, plays 3 of them, then hopes that another player picked the remaining two, as that will give them a free action and reduce the actions of the opposing player. Goods are tracked on two production wheels: one is for making brick and one is for making glass. In addition to those ‘refined’ goods, you have a bunch of basic goods. Refined goods are made automatically whenever you have one of every basic good on that wheel (and you lose one of each of those goods in the process). What do you want to do with those goods? You buy buildings to fill up your little Agricola-esque piece of land. Those buildings fall into one of three categories: conversion buildings which let you turn one type of basic good into another at will, immediate buildings that give you a one-off benefit, or victory point buildings that simply help you win (like the buildings in Puerto Rico). That’s it. You pick specialist cards, get goods, build buildings, rinse and repeat 4x, then hope that you’ve managed to string together enough complementary elements to achieve more victory points than your opponent(s). Deceptively simple. 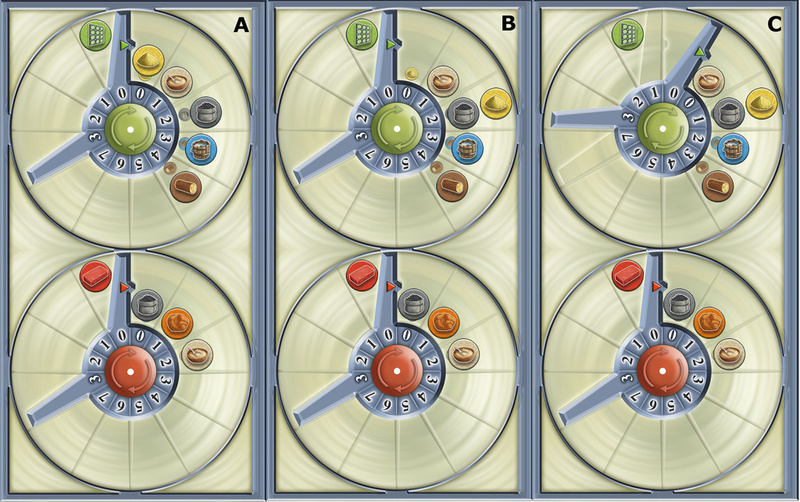 One final word on the production wheel; it’s a super cool mechanic but it definitely stretches your brain; you’ll have more than one instance where you forget to factor in the loss of your basic good when producing a refined good to make a purchase. Here’s the easiest way to think of it, even though it’s a little different from what the visual of the production wheel suggests: one of every basic good gets you one refined good, but the trick is that you have HAVE to create a refined good at that point, even if you don’t want to. Sometimes you’ll even make multiple refined goods at once! Love the mechanic that rewards you for picking 3 specialist cards that your opponent won’t pick and holding onto 2 that they will pick. Game play (likely) changes a lot based on number of players. The buildings and specialists are straightforward to a fault. Obviously you want conversion buildings and specialists that say things like ‘1 of this becomes 2 of that’, but why not a few more eccentric choices? The Fuel Collector gives you charcoal based on how many cards you have left in your hand. Cool! Why not a building that gives you a victory point for every time another player plays a card you had in your hand, or a Specialist that can only be played when another player’s glass wheel turns? Or even just a specialist that is likely to stay in your hand, but becomes a super cool ‘trump’ in just the right circumstances? Some variety, please! Maybe in an expansion?